Jutted teeth, or teeth that protrude outward, can cause insecurity and impact your confidence. Fortunately, treatments are available. One treatment for jutted teeth that we'll discuss today is Invisalign®. Invisalign® is a discreet orthodontic system that can straighten the teeth and improve the appearance of the smile, making it a popular treatment for jutted teeth. If jutted teeth make you want to hide your smile, Invisalign® treatment for jutted teeth may be right for you. Contact Skillman, NJ dentist James Altomare for more information. Jutted teeth are teeth that protrude outside of proper alignment. Jutted teeth are often related to genetics, but may also be acquired over time. Overcrowding is one of the most common genetic causes of jutted teeth. Overcrowding means there is not enough room in the mouth to accommodate the teeth, leading to some of the teeth being pushed outward. In other circumstances, jutted teeth are acquired through certain habits. Some of the most common habits to cause jutted teeth include bottle or pacifier use or sucking the thumb after the age of two. All of these habits can change the shape of the jaw, causing the teeth to protrude forward. Another possible cause of jutted teeth is tongue thrust. Tongue thrust is a disorder with the swallowing reflex. When tongue thrust is present, the tongue presses into the upper front teeth instead of the roof of the mouth. This regular pressure can cause the teeth to jut outward, altering the appearance of the smile. For some, jutting may be minor, while others may have more severe jutting. For those with mild to moderately jutted teeth, Invisalign® may be the best treatment option. Invisalign® is a modern approach to orthodontics that uses clear aligner trays to provide the benefits of traditional orthodontics without the obvious look of metal braces. Invisalign® treatment begins with the creation of a treatment plan followed by taking impressions of the teeth. The impressions are then used to create the clear aligner trays that will be worn throughout treatment. Aligner trays must be worn for most of the day and throughout the night for a total of about 22 hours. They may be removed to eat and drink and to brush and floss the teeth, making them comfortable and convenient. Aligners are replaced every two weeks to gradually reposition the teeth and correct the appearance of jutted teeth and other alignment issues. 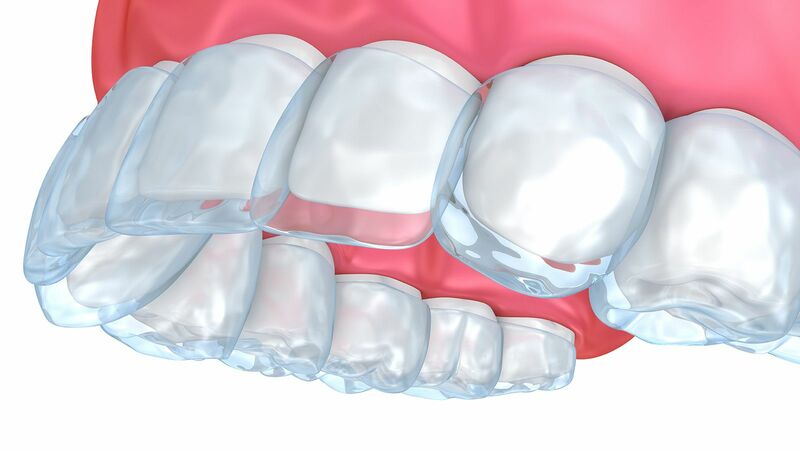 Once the teeth have reached the desired alignment, which takes about a year on average, a retainer will need to be worn at night to ensure the teeth maintain their new position. Discreet orthodontic treatment: Invisalign® uses clear plastic aligners to reposition the teeth and correct alignment so no one will be able to tell you're undergoing orthodontic treatment. More comfortable than braces: Invisalign® aligners are made of smooth plastic and may be removed while eating, making them more comfortable than traditional metal braces. Improved alignment: Jutted teeth can impact bite alignment, causing pain or discomfort when eating. Invisalign® repositions the teeth, correcting alignment issues and improving bite function. Enhanced smile and improved confidence: One of the most noticeable benefits of treating jutted teeth with Invisalign® is the overall improvement to the appearance of the smile. By creating beautifully straight teeth, Invisalign® can also help boost confidence. Now that's something to smile about! To learn more about Invisalign® for jutted teeth or other treatment options, we welcome you to schedule a consultation with Dr. Altomare today.